The other day, I posted a note on my office door as a reminder to myself that has been encouraging through my good days of work and ESPECIALLY through the bad. Now, for most of us, the phrase “gone fishing” sounds like “gone on vacation,” but my sign actually has nothing to do with checking out of work. In fact, it’s all about being MORE INTENTIONAL about my writing. One of my favorite stories has always been A River Runs Through It. 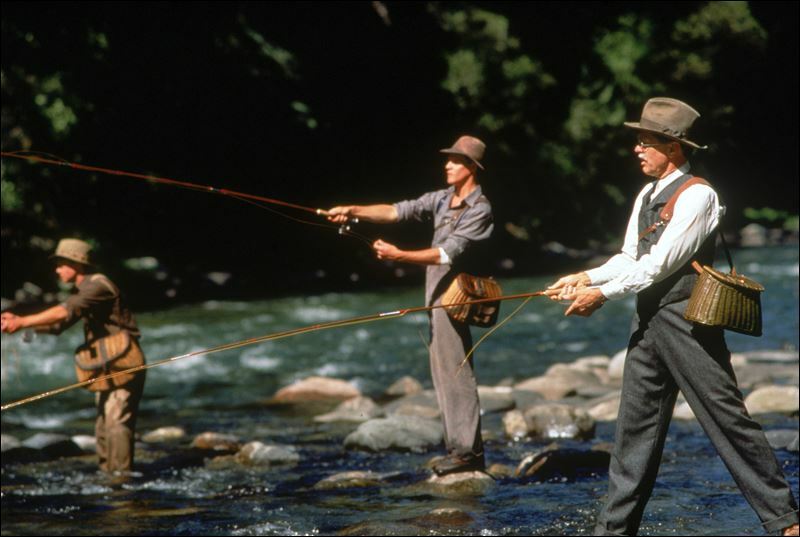 The Norman McLean novella is about two boys who grow up fishing the rivers of Montana with their dad. As they grow older, it is clear that fly-fishing is a joy they share, and an art they approach with reverence. They head to the river before the sun comes up. They use their own flies. They practice their own disctinct rhythms of casting. Yes, they sink beers along the river for later, but they are not there to party, they are there to fish with discipline and intention. They come before the great rivers with gratitude even on the days their efforts produce nothing. There may be many ways to catch a fish in Montana, but there is always one simple requirement: you have to show up to the river and go fishing. I’ve started to see this fishing metaphor as a big deal. It doesn’t matter what we do for a living: salesperson, professional athlete, musician, teacher, writer – we should all approach work a little more like fishing. Meaningful work is usually a little wilder, untamed, and ill-timed than we often realize… The truth is – our work is much more like the great rivers and the fish that swim under them. If your efforts “casting lines” on Monday equated to no fish and no cold beer, you’d be less likely to smile, laugh it off and plan the next day on the river… but that is exactly what the fisherman inside us requires. That is what the river demands of fishermen. The salesman knows a day with no closed deals just means hitting the river again early the next morning to cast lines. The artist understands that even those days staring at a blank canvas, a blinking curser, or an old guitar necessitates one more day wading into that stream. And weeks where nothing even bites. They fish at full strength. They know the secret to joy and meaning in their work is to show up to the great river each day with gratitude and reverence and faithfully cast their line. My “Gone Fishing” sign is a reminder that my work begins and ends with wading into the muddy water and casting faithfully each and every day. No matter what you do for a living, remember that a river runs through it… and that river demands your intention. So get out there with me today and lets cast a few lines.